The Venusian Swamp Gardens continue a series of works by the artist which engage the viewer in fantasy renditions of life on Venus. 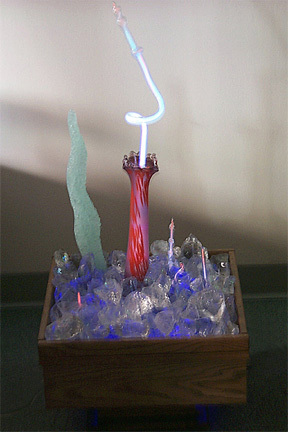 The base pedestal is made of hand-worked oak with an underlit plexiglas foundation for the neon and glass and comes in two sizes: 36" x 18" and 18" x 18". The piece is "modular" in two respects. First, there are multiple housings to hold the neon and glass "flora" allowing many different configurations for the garden. Secondly, each pedestal is designed to join together seemlessly with other pedestals thus allowing for multiple garden configurations of various sizes and shapes.